What began as a career change in 2010 for founder Adam Romanow quickly grew into a full-blown obsession of owning his own brewery. Research was conducted and plans were made. 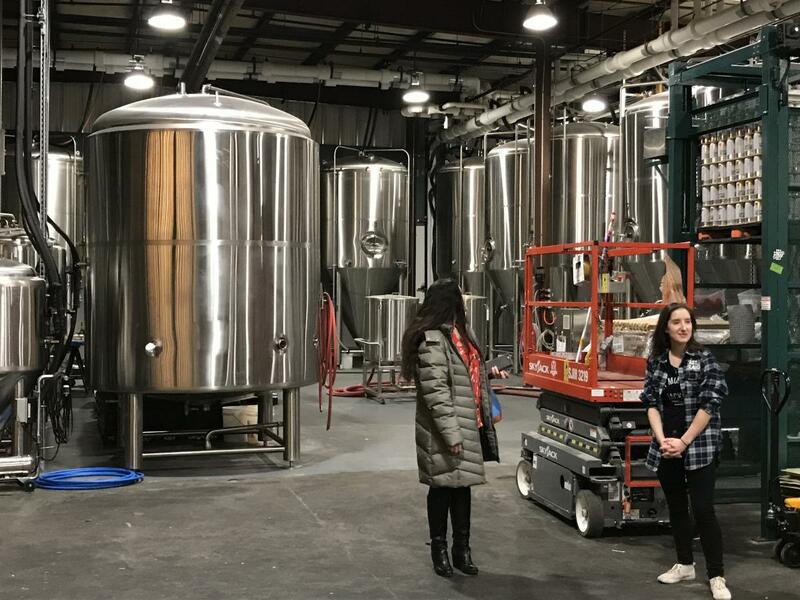 Named for the South Boston historical attraction, Castle Island Brewing looked for suitable space in the same neighborhood with no success. A relative suggested a space in Norwood, and in 2015 the lease was signed. By November of that year, Romanow was brewing up the first batch of beer with newly-hired head brewer, Matt DeLuca. A mutual friend introduced DeLuca to Romanow. Casual chats about beer first turned into an informal partnership, then into Castle Island Brewing Co. Prior to his role as head brewer, DeLuca worked for Harpoon for over nine years. DeLuca’s favorite beer? He thinks for a moment. “Right now, or in general?” he asks. His current favorite is Good Human American Pale Ale. Overall? Candlepin Session Ale. “It’s a style that really works for me as a beer drinker. It’s easy to drink.” He’ll always have a soft spot for the hoppy stuff, though. “Once you become a hop head, you’re always a hop head,” he laughs. Castle Island operates a retail counter and taproom from the same building as the brewery. The taproom is big and open. Picnic tables line the space, allowing guests to relax in a communal setting. On the wall hangs a projector used for the occasional movie night or video game competition. Other events are regularly offered as well, including 90’s-themed nights and air guitar competitions. Castle Island also participates in numerous pop-ups with local businesses. For those who want to bring beer home, the retail store offers everything available. 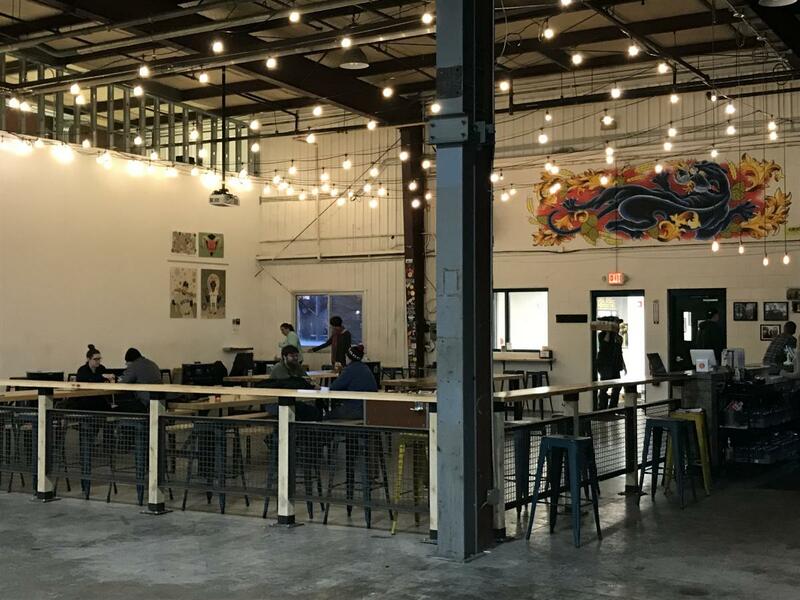 The taproom is open to the public Monday and Tuesday from 4-8pm, Wednesday through Saturday 11am - 10pm, and Sunday 11am - 6pm. In addition to beer, guests can also purchase a thoughtful selection of only locally-made snacks. Charcuterie from Moody’s Delicatessen and Kalahari Biltong are on the menu. To keep things simple, an order of chips and salsa comprises an entire bag of Mi Niña tortilla chips accompanies a container of Chica de Gallo salsa. Guests are also welcome to bring food or have it delivered from a number of local restaurants. The bar is sleek and modern, accentuated by neon lights. 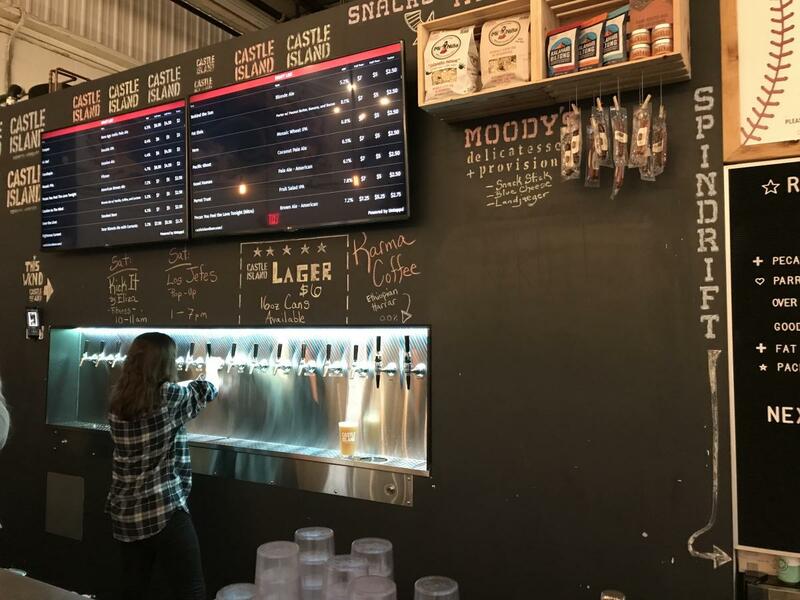 An electronic menu hangs above, displaying the 15 beers available on tap via their “Pilot System”, so named because like a television show’s initial episode, it’s used to get a sense of audience reaction to a new beer. “The pilot system allows us to get feedback from small groups,” says DeLuca. The current lineup includes Parrot Trust (a “fruit salad” IPA made with purees of guava, pineapple, peach, and apricot), Fat Elvis (a porter made with peanut butter, banana, and bacon), and Pecan You Feel the Love Tonight, an American brown ale actually brewed with pecan pie. All tap beers can be purchased in full pours, half pours, and tastings. For the time being, Castle Island is in Massachusetts only. Growth is definitely part of the long-term plan, but only if it can be done to their standards. “We want to grow as large as it makes sense for the company,” DeLuca says. No need to hurry things along, though. Growth will come. Best not to complicate things unnecessarily. “It’s about simplicity,” DeLuca says. A sentiment catching on more and more. Castle Island Beer Co. will be participating at this year's WGBH Craft Beer Festival Fundraiser this summer. Tickets are now available here.